Linger Longer is a game that tests the staying power of the players. In this game the tortoise may once again beat the hare. The object is to be the player the last player left holding cards. The dealer shuffles the cards and deals them one at a time face down to the players giving each player and equal number of cards. The remaining cards are placed in a stack in the center of the players. This stack become the stock. Once all players have their cards the dealer takes the last card they dealt to themselves and turns it over showing all the other players then places it back into their hand. The card shown is the trump suit for the game. Players arrange their cards by suit in order of rank with the highest ranking card to the left in each suit. Aces are high in this game. Also arrange the suits by alternating red and black. The player directly to the left of the dealer goes first. They play a card by laying it face up in the center. The next player goes by playing the suit or a trump card. You are trying to win the trick so play the highest ranking card possible. Play continues to the left until every player has played their card. trick. 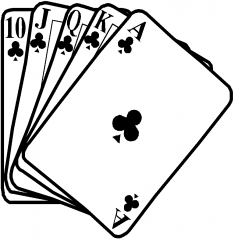 The cards from the finished trick are placed to the side and the winner of the trick takes the top card from the stock adding it to their hand. The winner then plays the first card starting the next trick. If at anytime during the game a player runs out of cards they immediately withdraw from the game. The player who is able to linger longer than the rest and is the last player holding cards is the winner.